Play! Play!! Play!!! I can’t emphasize this enough. While there must be a marriage between your heart’s passion and your brain’s ability to reason, art must be about playing. Play with an idea… make it your own. How you see the world around you is unique to you. If you are true to yourself, your art is automatically original. Special, like you. My finished work, while complicated, ends up looking a bit like an advanced coloring book with bold outlines and splashes of color, texture, and pattern. Decoupage paste or Liquitex mediums are used to adhere paper and fabric to my canvas. Play with the mediums because you get very different results with ultra matte, matte, satin, or gloss. For heavier items such as sea glass or pebbles, I use mosaic adhesive. Be careful, you’ll want the kind of glue that dry clear. I’ve made that mistake before!! I finish my pieces with Liquitex Satin varnish, usually 5 or 6 coats over a period of days. Make sure it dries thoroughly before applying the next layer. I’ve never tried to varnish over 3-D objects like stone or wire so consider your finished piece & decide the best time to protect it. I varnish before I put on 3-D objects. I’m glad I was asked this question. It makes me stop and think about what I do & why. I guess I really break collage down into two equally important components: my heart and my head. My heart allows me to create with passion and make pieces that resonate with others who view and buy my work. My brain recalls years of training in proportion, composition, and color theory. It must begin with the heart, which answers the questions — What do I love? What am I passionate about? What do I need to express in my art? (The answers to those questions will come up in later blogs.) You’ll want to answer those questions for yourself. For example, I saw a powerful image of a wolf howling at the moon. It really spoke to me so I sketched it several times, letting myself play with the composition. After I create a sketch that satisfies me, I consider how I want to express it… on canvas? bristol board? watercolor paper? Lately, most of my collage work is on canvas because it allows me to use a variety of materials, responds well to cutting and poking with wires and exacto knives, and handles the weight of some unusual materials such as slate and pebbles. Still operating from the heart (which means “leave the brain out of it”), I dig through my boxes and drawers full of materials to see what captures my eye. “Okay Wolf, talk to me. What do you want to look like?” I stay playful at this point, not analyzing my choices yet, simply picking what I like at the moment. What captures my imagination and speaks to my heart? Do certain patterns or textures stand apart from the rest? I pick from fabric, beads, small stones, handmade papers, photographs, ticket stubs, menus, sheet music… whatever! A pile of seemingly unrelated items begins to grow. Once I feel like I’ve exhausted my available materials, I take a deep breath and put everything else away so I can focus on the materials I’ve chosen. I spread out all the items, looking for things that go well together, narrowing down my selection a bit to include things that go well together and communicate the feeling I want to communicate. 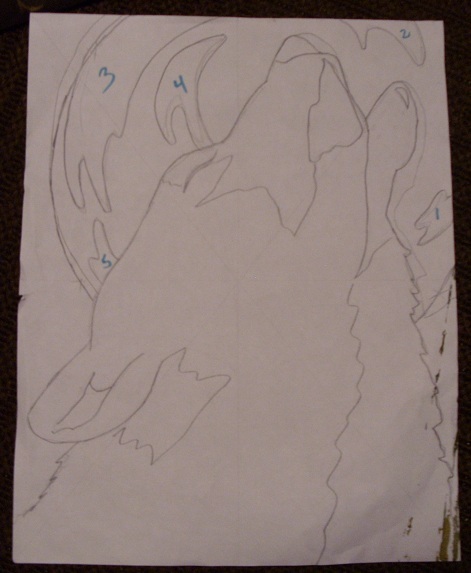 Now, my wolf may not be “wolf-colored”, this isn’t about realism. It’s about having fun and trying new things. 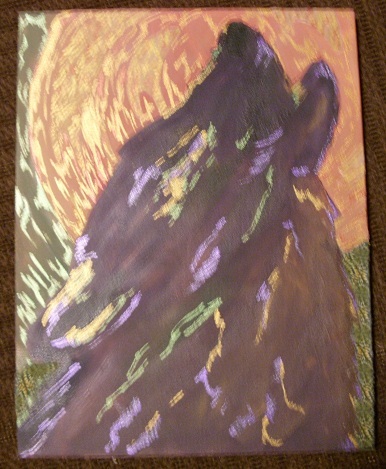 In fact, this wolf wants to be purple with a coppery orange moon hanging in an olive green sky. I sometimes wonder if I’m creating the art or simply acting as a conduit for art that wants to flow through me, out onto the canvas. Okay, I have a sketch, a pile of materials, and the foundation for this piece (a small canvas). Now what? Stay tuned….